We are a group of compassionate and caring women that come together quarterly to have a BLOG HOP that shows the banners that we have designed, made and donated to the Pediatric Specialty Care Center. The banners are hung in the rooms of special needs, medically-fragile children at Pediatric Specialty Care (www.pediatricspecialty.com) in Bucks County, PA -- where Hop Coordinator Ellen (Card Monkey) Jarvis works as Admissions Coordinator. I am glad you stopped by today to join us in the hop and if you came from the talented Ashley of The Glamourous Side of Scrapping you are heading in the right direction, if you would like to join us please go to Ellen of Card Monkey and start the hop there. For my banner I used Fancy Pants It's Your Day Paper collection, it is a birthday collection but I think it so bright and cheerful that I used it for my banners and blossoms. My banner, blossoms, butterflies and bunnies are all made from chipboard. I added large buttons tied with ribbon to the center of my flowers. I cut my bunny from kraft paper and then used chalks to chalk up the bunny to give it character, I all did all the details with a Le Pen Brown pen, added a black rhinestone eye and a red gingham bow at the neck. All of the dots has Glossy Accent on them to give some depth to the banner. I made my fence on my Cameo and then did the line work with my Le Pen Brown pen. I love doing line work it always makes a project come together. My fun flowers are from Tim Holtz Tattered Flower Garland die. They are so pretty and I made a few of my roly poly flowers to go along with them. I added some green gemstones to the center of the flowers. My bunny I drew on to kraft paper and again did chalking and line work to give the bunny life. For this banner the letters are Basic Grey letters from a sticker sheet that I had. Again, I did another giant flower with the large button. I also added Glossy Accent to the circles on the paper. I did a mirror image of the banner two for my 4 banner. I just love how it turned out. The little birdie is from EK Spring Chicks sticker sheet, they have a grainy look to them and are very cool to use. My last banner is again with the large blossoms chipboard along that I have used Glossy Accent circles with another of the chipboard butterflies. The center of the flower is from Lil Davis Designs. 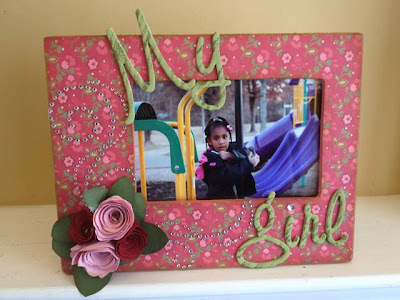 Today I am so excited to share with you a frame that Sharmiece made for her Guest Designer. She is helping me get ready for the blog hop that I am hosting this weekend (March 23 and 24) called "All Things Altered". The hop is going to be amazing with some of the most fabulous projects from some of the most talented designers that I have come to know and that includes the fabulous Sharmiece. I used a unfinished frame from Michael's. The patterned paper is Echo Parks Red Floral. I painted the inside/outside of the frame and the chipboard letters with Making Memories paint. I attached the paper with Mod Podge. Sanded around the edges to take off the stray pieces that where left behind. The bling was add once the flowers where attached. The paper flowers where rolled with Bazill cardstock and attached to the frame using hot glue.